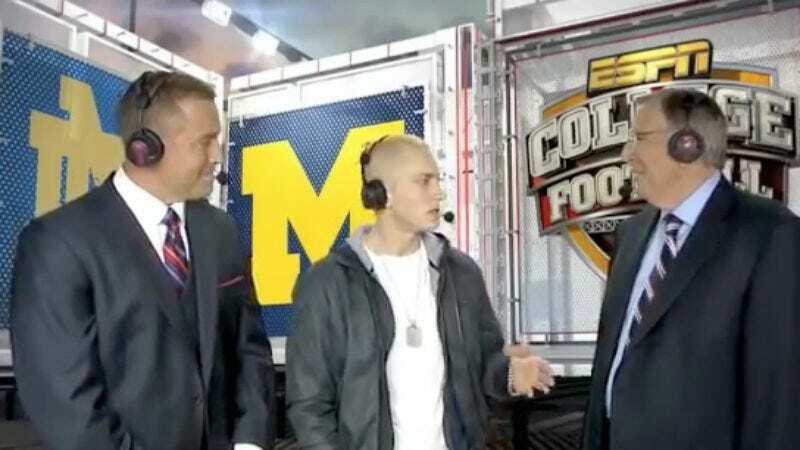 Eminem showed up in the anchor booth on ESPN’s Saturday Night Football this past weekend, and the resulting three minutes of programming were pretty bizarre. Eminem—who said during the broadcast that he’s freaked out by live TV—was ostensibly on the program to hype his new single, “Berzerk,” but probably also because the college game being played, Notre Dame v. Michigan, wasn't too far from his home near Detroit. Throughout the clip Em appears either stoned or stunned (or at least pretends to be), spending most of his time in the booth just gaping at the anchors, and saying almost nothing about his Nov. 5 record, Marshall Mathers LP 2, beyond noting that he’s “excited just to be done with it.” (He did lighten up a little toward the end of the segment, when commentator Brent Musburger asks him about his love of the Detroit Lions.) The full video for "Berzerk" is below the clip, in which Eminem seems at least a little more animated.